Last night, I hit 9,000 likes in Apron and Sneakers Facebook page. It's an incredible number to see and I wish I can shake your hands one by one for giving me the support I need. It's a very nice pat on the back for letting me know that I can do it and you like what I am doing. I can't help thinking back almost 3 years ago when I first hit the publish button in the computer. I thought, Who will ever read what I post? Only my husband will be my follower! As the years passed, I made a lot of mistakes, learned from them and stood up again. A solid foundation came out from my frequent stumbling. Every accomplishment was welcomed with an emotional happy tear. I'm getting there. Where? I really have no idea! I am enjoying myself and I love what I am doing. That's what's important. But I am aware that I am also tiring myself out too much. I know that what I am doing right now is not permanent so I am making the most out of it. 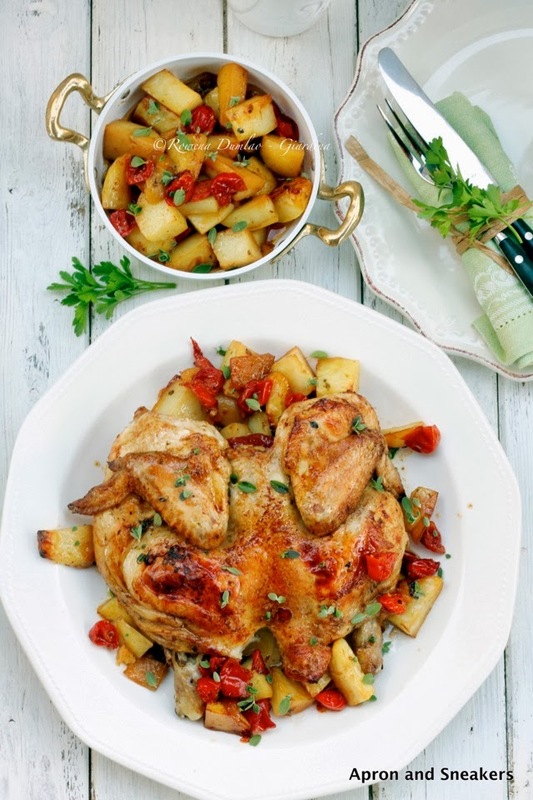 For the recipe today, I know, not another chicken and potato dish! My kids' food selection is on the limited side. 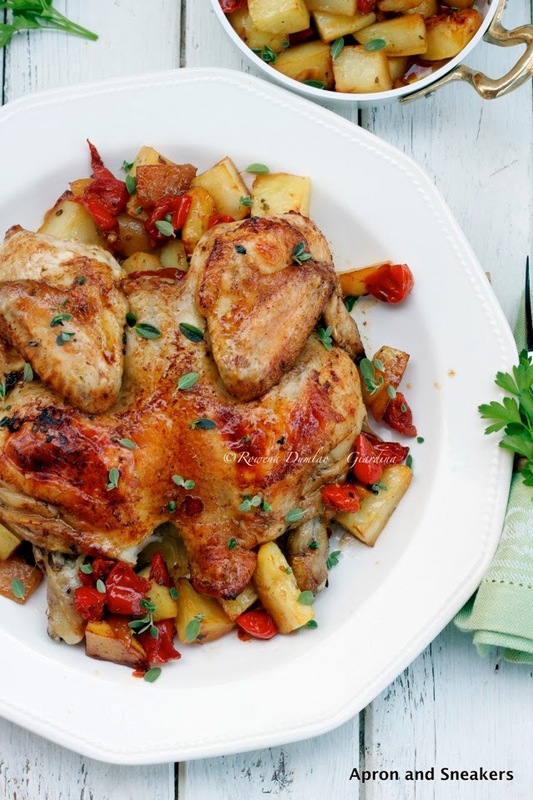 My son loves chicken and potatoes, but the classic Italian one, baked with rosemary only (which reminds me, I haven't posted one yet!). No surprises Mommy! That's because I try to be creative sometimes, to change the things a bit but however much I try, it's the basic one that wins! Kids' criticisms aside, my husband and I love how this chicken dish came out. 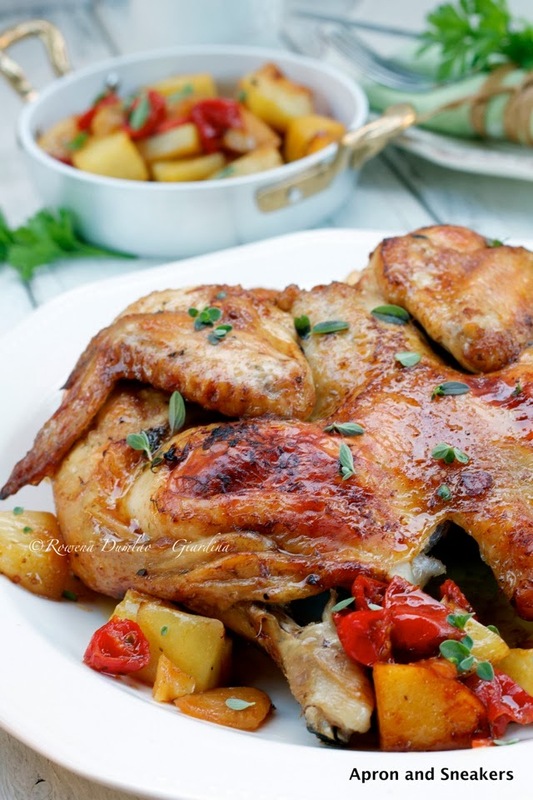 The balsamic vinegar, grilled peppers and dried oregano created a canopy of outstanding flavor to the chicken and the potatoes. This is a perfect Sunday lunch when the whole family's around. I hope you enjoyed your Sunday! Rub the chicken with 1 tablespoon oregano, salt, pepper, 4 tablespoons balsamic vinegar & extra virgin olive oil. Leave it in a baking dish for an hour. In a bowl, coat the vegetables with 1 tablespoon balsamic vinegar, salt, pepper, 1/2 tablespoon dried oregano and extra virgin olive oil. Add the vegetables to the baking dish. Cook at a pre-heated oven of 200°C for 1 hour or until golden brown. If you are using a convection oven like I normally do, I start the fan after 45 minutes of cooking and it remains on for about 15 minutes or until the skin becomes golden brown.